MakerBot showcases two students whose 3D printing designs give MS and Parkinson’s patients tools to open pill bottles, hold a fork. 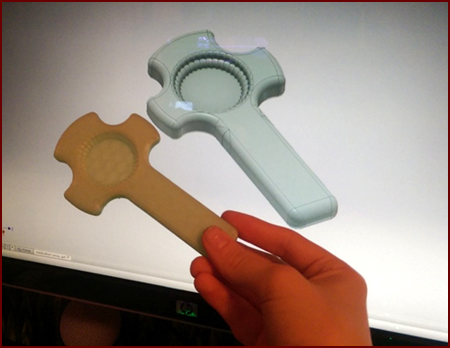 Part of the appeal of 3D printing is witnessing ideas come to life. As the technology becomes less expensive, more students are getting a chance to breathe life into their ideas. The 3D printing company MakerBot recently showcased five 3D print designs from students on Thingiverse, its online community for 3D tinkerers. Some designs included a music box, a handheld representation of a colisseum, and a blown-up version of bacteria. But two student-made designs were focused on helping others. “Just like a 12-year-old Mark Zuckerberg went from writing a private messaging application to creating Facebook, any one of these student 3D designers now has the skill to design tomorrow’s game-changing innovation," according to a MakerBot blog post. EdTech spoke with two of these student designers to discover what got them interested in 3D printing, and where they see the technology heading in the future. Matt, 17, created a medication bottle opener. His father has multiple sclerosis, making it difficult to open pill bottles. So Matt came up with a cross-shaped design with a handle that makes opening pill bottles a breeze. He's been contacted by companies interested in commercializing his design, MakerBot says. "I got the idea for the medication bottle opener from trying to think of a way to use the grooves in the top of the bottle," Matt says. adding that he iterated on the design before finalizing it in a matter of hours. Matt, a senior in high school, has been tinkering with 3D printers since his sophomore year. He's been helping his fellow students learn Autodesk Inventor, a 3D design program, in his school's Intro to Engineering Design class. "Almost two years ago, for my 16th birthday, my parents offered me a choice between a 3D printer or a car. I took the printer, and that's been one of the best decisions in my life," he says. Matt says just about anyone can become skilled at 3D design and printing. It just takes time, dedication and the spark of imagination. "It takes some creativity, experience, practice and patience, but once you get started, it's hard to stop. Heck, I have spent more hours on my 3D printer than I have spent on video games," he says. Brian, 16, also had a tool to help those with disabilities in mind when he made a fork with guards that makes it almost impossible to drop. One of his father's acquaintences has Parkinson's disease and has trouble holding utensils. 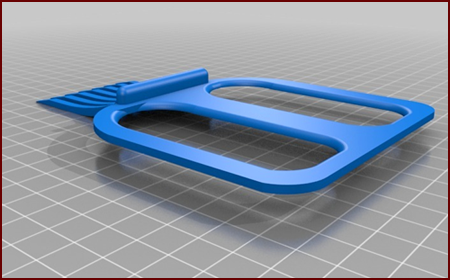 "I had the idea that if I could create a fork that anyone could use, with extra support to make it more difficult to drop unwillingly, that it could help him out and make him more independent," says Brian. He began designing and printing 3D objects as soon as he learned his high school had a 3D printer, thanks to its science, technology, engineering and math programs. Since then, he has been refining his talents. He says he's interested in pursuing a career in engineering, specializing in additive manufacturing. "On the printing side, it’s very easy to start. And the more you do it, the more you learn how to diagnose hardware problems and solve them yourself," he says. Both students have big dreams for the future of 3D printing. "I see 3D printers becoming a common household item in the future, and 3D printing hubs popping up around in major cities in the upcoming years,” Brian says. “I would very much like to see more shops and hubs opening in smaller towns, helping to boost the awareness of how helpful 3D printers could be." Matt is excited about the potential of new materials, such as sand, sugar and chocolate, with which to print 3D objects. Eventually, he sees 3D printers intersecting with medicine. "I could probably write essays for months about the applications and benefits of bringing 3D printers into the medical field,” he says. “But the application I'd most like to see is the ability to 3D print working organs and other essential body tissues such as myelin, the coating around your spine that can get attacked when one has MS, like my father."